In the weeks before my now-10-month-old daughter, Julie, was born, I tried to learn as much as I could about labor and delivery without forming any expectations for my own experience. I hoped for the best, but mentally prepared myself for all sorts of worsts, just in case. Then, in the final moments of my nearly 24-hour labor, I ended up having a thing I didn’t even remember reading about: chorioamnionitis, or “chorio” (like Oreo with a hard C sound at the beginning), for short. It wasn’t as bad as many of the other “worsts” I’d prepared myself for, but it got us stuck in the hospital for an extra week, which obviously wasn’t ideal. So I figured I’d share my tale so that any expecting moms reading it are aware of one more potential scenario. I'm smiling because I have no idea what's about to happen to me. My labor started out pretty typically. 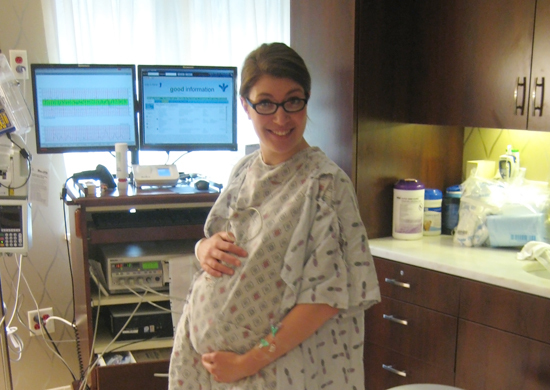 I was 40 weeks and six days pregnant, and woke up at 4 on a Tuesday morning with contractions. 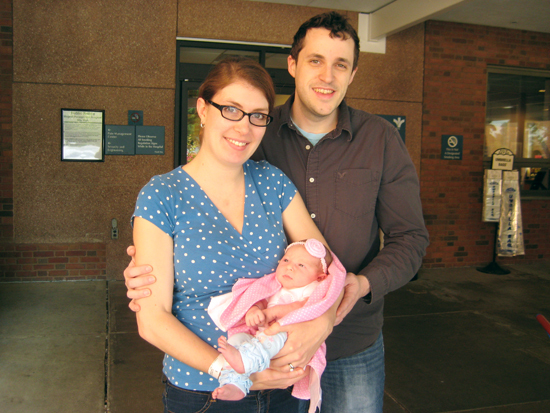 I labored at home for a bit; then, my husband, Matt, drove me to the hospital around 9. I wasn’t dilating very quickly, so at 1 p.m., a doctor came in and broke my water. Dozens more contractions, several different positions and one epidural later, it was after midnight and finally time to start the actual delivery. I felt weak, exhausted and kind of strange, but I figured, “Well, this is childbirth.” The prospect of holding my baby girl soon got me pushing. Unfortunately, she hadn’t moved much after a half hour, so we took a break. When we resumed, my attending nurse felt my head and exclaimed, “Oh, Mama, you’re hot!” It turned out I had a fever of 101; plus, my heart rate and the baby’s were both high. That’s when I heard her say the word to one of the other nurses. Suddenly, there were a lot more people in our room, and it was clear to me that it was Go Time. I pushed with every morsel of energy I could muster — so hard, in fact, that I threw up. Julie’s head was stuck under my pubic bone, so my OB/GYN had to use a vacuum (which seemed more like a glorified suction cup on a string to me) to pull her out as I continued to push. I suffered a third-degree tear, and Julie was covered in meconium (her first bowel movement) when she finally emerged at 2:51 a.m.
Good thing I tried not to have any expectations, right? 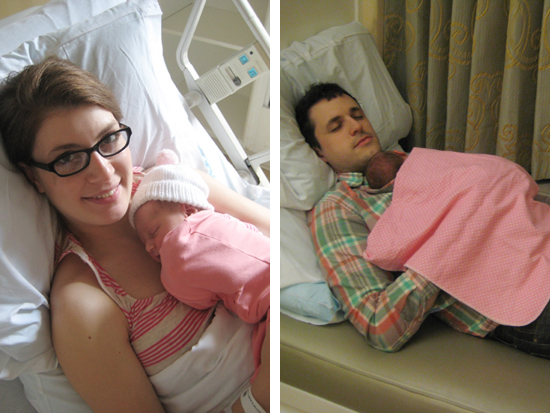 Matt and I got to hold Julie briefly, but then she was whisked away to receive antibiotics because she, too, had the infection. I would only need antibiotics for 48 hours; she would need them for an entire week. Fortunately, our hospital lets moms and dads of newborns who need prolonged care stay in their rooms as long as they’re not needed by other patients. So although I was “discharged” from the hospital on Friday morning, Matt and I both stayed put until the following Wednesday. We sure missed our queen-size pillowtop at home, but at least we had our girl. Julie got her vitals checked every 24 hours from her birth (every night at 2:51 a.m.), received her IV medication every 12 hours from her first dose (at 5 p.m. and 5 a.m. daily), and the pediatrician checked on her every morning at 7 a.m. Needless to say, we didn’t sleep much. It certainly wasn’t the most ideal way to spend the first week of our daughter’s life, but we tried to focus on the positive things: all of the doctors, nurses and hospital staff members were amazing; we had lots of sweet visitors once we convinced them the infection wasn’t contagious; I got to spend extra time with the hospital’s lactation consultant, and breastfeeding went extremely well; we ordered some delicious food from nearby restaurants; we got fresh air in the courtyard, where the azaleas were in bloom; and we used a ton of free diapers. When it was finally time to go home Wednesday morning, I’d been up walking around the hospital for days, but the volunteers insisted on wheeling me out with Julie in my arms like all the other mamas. I’ll never forget all the smiles we got as we creaked down the halls and out the sliding doors into the sunshine. The day my daughter was born was not the happiest day of my life. The day we busted out of that hospital was. We're smiling because we get to go use our own bathroom. Mollee and her husband, Matt, live in Midlothian, Virginia, with their daughter, Julie, and their two Chihuahuas. Formerly a graphic designer, Mollee now stays at home with Julie, but she still enjoys making things with her hands and blogging about them. Find her recipes, paintings and crafts at molleemade.com. Love your storytelling, Molly. And I agree that sometimes the “birth day” is not the happiest day, for a lot of parents … but luckily, there is a lifetime ahead to make happy memories together Hugs to you, friend! P.S. SUPER SORRY I spelled your name wrong!!! *Mollee. What am I thinking? !